Earlier this month, we looked at the latest phones from Samsung and HTC. Both phones were revealed at the Mobile World Congress early in March, so let’s take a look at how they compete with each other. Galaxy S6: Corning Gorilla Glass 4 front and back with aluminum sides. Weighs 138 g and is 6.8 mm in width. Bottom facing speakers. Heart rate monitor and finger print scanner. HTC One M9: Full aluminum unibody weighing 157 g. 9.6 mm in width. Front facing speakers. 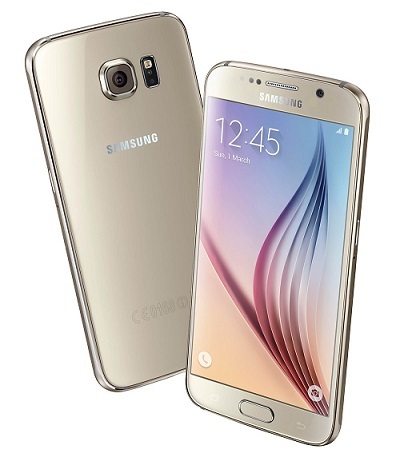 The Galaxy line was completely revamped by Samsung with the release of the Galaxy S6. Finally ditching the plastic and faux leather, the S6 comes with a gorgeous front and back held together by a classy metal trim. It’s also incredibly light and thin, meaning it may be harder to grip. Samsung has moved the speakers from behind the phone to the bottom of the phone, significantly increasing sound volume, quality, and practicality. The S6 also sees the return of the heart rate monitor and an upgraded finger print scanner. Owners will now be able to tap and hold their fingers rather than fight with the awkward positioning of the swiping motion previously required. The One M9 stuck with its well known and loved full metal body. This time around, HTC actually shrunk the phone a little (in comparison to its predecessor), and made it a little thicker. This new design is meant to make the phone easier to grip, given the complaints that customers had about the M8 slipping out of hands. The front facing speakers are now louder, more vibrant, and has more bass. We don’t think there’s any current competition for HTC’s BoomSound. Galaxy S6: Super AMOLED 5.1 inch screen with about 70% of screen-to-body ratio. 1440 x 2560 pixels at about 577 ppi pixel density. Shielded by Corning Gorilla Glass 4. HTC One M9: Super LCD3 5 inch screen with about 68% of screen-to-body ratio. 1080 x 1920 pixels at about 441 ppi pixel density. Shielded by Corning Gorilla Glass 4. Samsung stuck with a 5.1 inch display with the S6, but packed a lot more pixels to up the pixel density. It’s reported that approximately 70% of the phone’s front is the display. This means that the borders surrounding the display are quite thin, leaving its users the nice impression of an bigger display protected by the latest Corning Gorilla Glass 4. The One M9 has a smaller display with a smaller screen-to-body ratio, meaning that not only is the screen actually smaller, but when compared side by side with the S6, it also appears smaller as well. HTC also chose to stay out of the pixels war and left the pixel count at what it as in the M8. When compared side by side, the S6 screen looks a lot more vibrant than the One M9, but it may only be noticeable when you specifically look for differences. Otherwise, the screen on the M9 is more than enough for a gorgeous display. Galaxy S6: Variants of 32GB, 64GB, and 128GB with no option for expandable memory. HTC One M9: Only the 32GB model available, but with option to expand up to 2TB of external memory. With the widespread emergence of cloud memory, it seems like physical memory is not as important. However, users have grown used to the idea of Samsung phones supporting additional storage, so losing this feature is a big change to the Galaxy family. Users of the S6 will need to decide how much internal storage they want when purchasing the phone, because there’s no expanding it later on. Owners of the M9 will not need to make such a decision. The phone comes with only 32GB of internal memory, but is capable of utilizing a 2TB microSD card. Granted, a 2TB microSD card isn’t available just yet, but you’ll will be able to use the SanDisk Ultra to supplement the phone with an additional 200GB of storage. Given that microSD cards are both relatively cheap and replaceable, buying one to boost storage seems like a much better deal in terms of getting the most memory for your dollar’s worth. Galaxy S6: 16MP rear camera with autofocus, LED flash, and optical image stabilization. 5MP front camera with dual video calling. 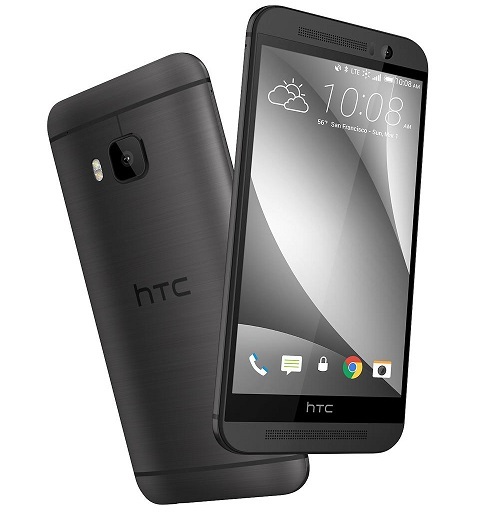 HTC One M9: 20.7MP rear camera with autofocus, dual-LED flash. 4MP UltraPixel front camera. The S6’s predecessor touted a good camera, but the additions done to the S6 make it a great one. The OIS helps a great deal stabilizing the camera even while you move around, and the 16MP camera ensures the quality of your photos. You’ll also be able to include everyone in your selfie with the wide-angle 5MP lens up in the front. The M9 finally put in a real 20MP camera in the rear, much to customer’s satisfaction. It also features a dual-LED flash, which is supposed to make colours more natural. The front camera is adorned with 4MP, accompanied by UltraPixel for better lighting and clearer selfies. Both companies have blazed a trail of their own with TouchWiz and Sense. There have always been complaints regarding bloatware and lag with TouchWiz, but we’re finally starting to see Samsung responding to these complaints. TouchWiz on the S6 should prove to be one of this company’s most bloat free devices to date. Of course, there are a few goodies packaged with this system that many have grown to love. We have the S Planner, S Note, and badge counts for notifications. HTC features the new Home Sense Widget with a Theme Generator. People generally don’t complain about lag when it comes to the Sense UI, but that may be because it’s very close to stock Android, which is notable for being buttery smooth. Home Sense looks good on paper, but it might not be as practical when used. Theme Generator will be very popular with those who love to personalize their phones. Fans of the Galaxy phones for their interchangeable batteries may be looking toward other options, because both phones now feature sealed batteries. 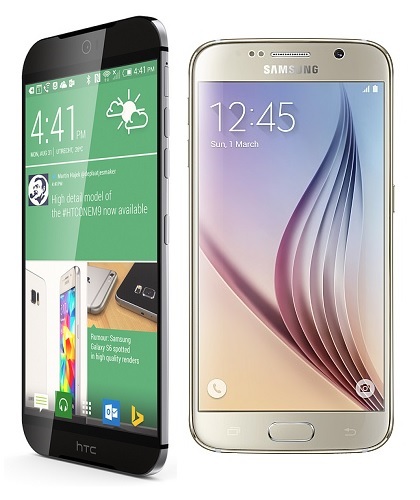 Even though the S6 packs more pixels, it has a smaller battery than the M9. We think that this might be because Samsung wanted to keep their phones as thin as possible, but we’re not sure that this was the best decision to make. In an age where people are constantly carrying chargers, it’s arguable that battery life is a deal breaker when it comes to choosing a phone. The phone comes with Samsung’s own Exynos 7420 rather than a Qualcomm processor, so we’ll see how it affects battery life. HTC chose to ramp up their battery capacity to 2860mAh. Coupled with a smaller display and a smaller pixel count, we’re sure that this will easily be a day-and-a-half phone. It also has Qualcomm’s own Snapdragon 810 processor, which operates on either of the four higher or lower processing cores in order to maximize efficiency. It’s interesting to note that according to Droid Life’s poll on which phone their readers would rather buy, the S6 Edge takes the lead, followed by the S6, before we have the M9 in last place. Will you be getting the S6 for its fantastic camera and revolutionary body, or will you carry on the HTC legacy with the M9 for its expandable memory and bigger battery? Which phone will you buy? No matter which phone you choose (or even if you purchase both! ), cellunlocker.net will help you unlock it! You should be able to buy your new flagship phone locked from most service providers. If you’re in Canada, you can look toward Telus, Bell, and Rogers. USA users can visit their nearest AT&T, or T-Mobile store.